Earlier this week we took a look at LastPass’ new Auto-Password Change—a beta feature that, as its name suggests, automatically changes your passwords for you. With Auto-Password Change there’s no need to jump through a confusing jumble of websites to change your passwords. 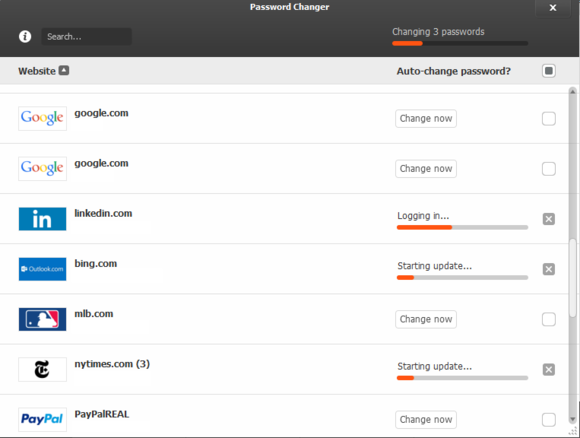 Just make a few clicks lets you change each password right within LastPass itself. We also mentioned that rival Dashlane came out with a similar feature, which was a result of its recent acquisition of PassOmatic, an automated password changing service. Dashlane’s service launched as an invite-only beta that we didn’t have access to so we couldn’t take a look at it. 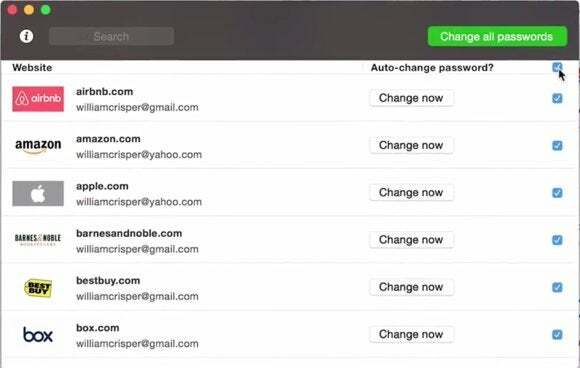 But after talking to the company we recently got our hands on Dashlane’s Password Changer to try out its main attraction: Changing multiple passwords for different online accounts simultaneously. When Password Changer is active in your account, a yellow button appears in the main window of the desktop app under Passwords. Click it and a new window opens listing all the passwords available for automatic changing. Dashlane says its service currently works with more than 75 sites right now. On the far right of the Password Changer window are check boxes. All you have to do is select the passwords you want to change and then click the green Change [X] passwords button. And that’s it. Well, almost. Dashlane’s Password Changer can handle two-factor authentication. Dashlane will change all the passwords you requested, but it does require a little more work if you have any accounts with two-factor authentication enabled—and you should. 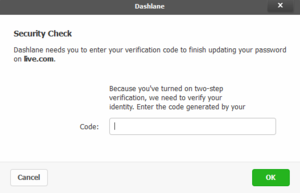 Dashlane is smart enough to ask for your authorization codes. The app will throw up a window inside the app asking for your two-factor token. At that point you need to fire up the authenticator app on your mobile device, get the authorization code, and enter it into Dashlane. If you’re changing multiple two-factor authentication sites at once you can expect to see a window for each one. Dashlane can also ask for the answers to security questions if that is part of the password changing process, as it is for Apple.com. I used Dashlane to change five different sites and services in two batches: Apple, Dropbox, LinkedIn, my Microsoft Account, and The New York Times. The only hiccup I experienced was with LinkedIn. The site asked for a security code since Dashlane’s automated service set off a suspicious activity alert for my account. The code was sent to the primary email address associated with my LinkedIn account. You may experience similar issues. That’s about all there is to Dashlane’s Password Changer. In my brief time with both Dashlane’s and LastPass’ new features, I have to say that Dashlane’s is far more mature. I never tried PassOmatic so I can’t say whether Dashlane simply repurposed the technology from the defunct service or if Dashlane made a major overhaul to PassOmatic’s feature set. Regardless, I was impressed with what Dashlane’s service could do. It was able to handle security questions and two-factor authentication issues with little to no trouble, and you could change multiple passwords at once. 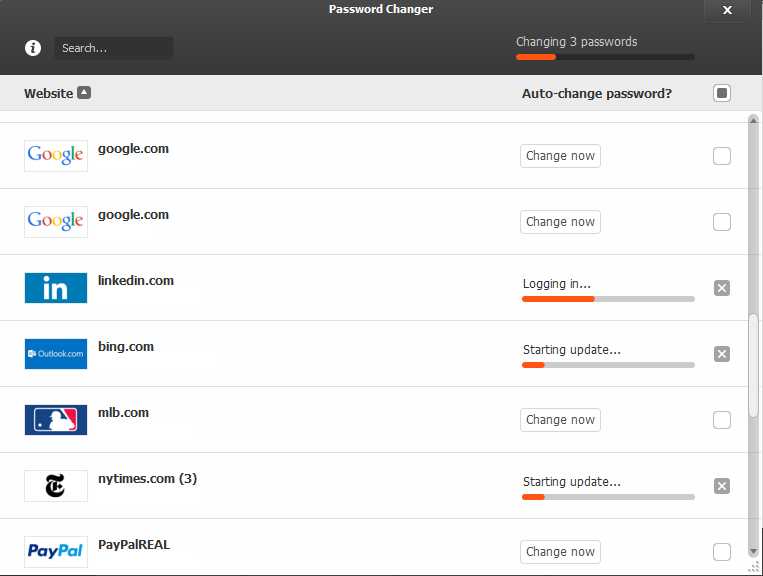 Things that, in my tests, LastPass’ Auto-Password Change feature couldn’t do. Don’t forget, however, that both features are currently in beta and may improve or add new features over time. I’m a regular LastPass user and the robustness of Dashlane’s Password Changer has me seriously thinking about changing services. The only drawback is that LastPass Premium costs just $12 per year, while Dashlane’s premium option costs more than three times that, at $40 annually. Both services require a premium subscription to access your passwords across multiple devices.